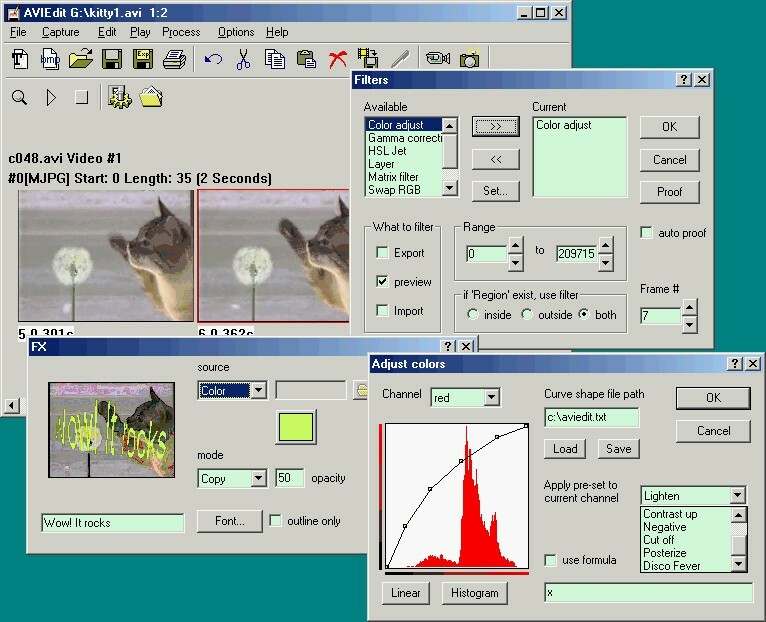 AVIedit 3.38 is other software developed by AM Software. Video editor and capture tool for Win95/98/NT4/Me/2000/XP. AVIedit allows you to watch/capture frames and videos (inc. fullscreen), enhances your videos with 30+ built-in effects (twirl, skew, flower etc. ), Adobe(tm) Photoshop compatible plug-ins, it changes brightness, sharpness and even frame rate. Import of bmp, JPG and TARGA images, print frames and export them to GIFs/FLI/FLC. Can add/remove audio tracks, create titles, use TWAIN scanners. This program is shareware, which means you can download and use AVIedit 3.38 for free during 30-days trial period. After this period you gonna have to buy AVIedit 3.38 software for $25.00 or uninstall the program. AVIedit 3.38 supports different languages (including English, German, Russian, French, Italian, Spanish). It works with Windows 98/XP/Vista. Latest AVIedit 3.38 does not contain any spyware and/or advertise modules, allowing installing it with no worries concerning valuable information loss. We has completely tested other software AVIedit 3.38 many times, written and published the interesting article and uploaded installation file (644K) to our fast server. Downloading AVIedit 3.38 will take several seconds if you use fast ADSL connection. Capture IT! is a utility for Mac OSX that allows you to quickly capture single or multiple video frames right to your hard drive.